I’ve been using my time as a stay at home mum to do some research about different early childhood education philosophies. I started by picking up a book about Steiner principles and how to bring to life at home. At the same time I picked up a book on Steiner Snacks, by Jinda Yasuko. Apparently in Steiner kindergartens/preschools, the kids have a different grain snack each day of the week, giving them carbohydrates for energy and lots of minerals and fibre. I was interested in these recipes because they use unrefined grains and no eggs, milk products or refined sugars. 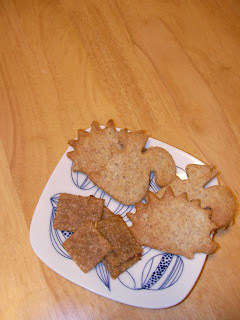 Ignoring the days of the week rule, I made a couple of recipes from the book – Rye Crackers and Ginger Cookies. Both are very simple to put together and interesting to work with. The dough had a texture almost like modelling clay – slightly tacky, but easy to handle. I rolled both doughs between cling-film before shaping and baking. Measure the flours and salt into a medium bowl and mix well, then cut in the oil. Add the apple juice and mix to combine. The dough will look wet, but is surprisingly easy to handle. Roll the dough thinly between two sheets of cling-film and cut into 2 cm squares (remember they’re crackers for kids!). Bake for 12 minutes in an 180C oven. Makes enough for approximately 6 – 7 kids. These crackers are very plain and slightly chewy. Measure the flours and salt into a medium bowl and mix well. Cut in the canola oil. Mix the ginger juice, maple syrup and soy milk/apple juice in a small bowl then add to the flour, stirring to combine. (If the mixture is too dry, add a little more soy milk or apple juice. Note, the dough will look wetter than a ‘regular’ dough). Roll the dough out to approximately 3 mm thick between two sheets of cling-film and cut out cookies. I used cookie cutter approximately 6 cm in diameter. Bake for 10 minutes in a 160C oven, then increase the temperature to 180C and bake for a further 8 to 10 minutes. Makes 20 – 35 cookies, depending on cutter size! The cookies are only mildly sweet and pleasantly spiced. Perfect for the whole family.